LOWER EAST SIDE — The birthplace of modern tattooing is about to get its own museum. In a nod to the legacy of body art that sprang up in nearby Chatham Square and the Bowery, the Lower East Side tattoo parlor Daredevil Tattoo is transforming part of its Division Street store into a museum, showcasing hundreds of pieces of memorabilia, including tattoo design mockups more than a century old. 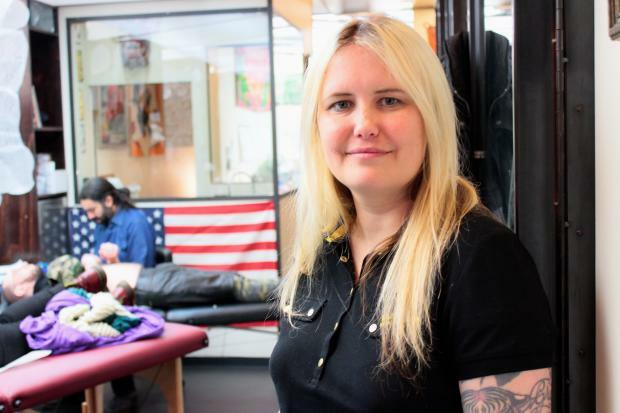 "We are right in the midst of this really rich historical area for tattooing in New York City and for the country," said Michelle Myles, 42, who co-owns Daredevil with her business partner Brad Fink. Daredevil's planned Tattoo Museum — which owners hope to open in May — will allow museum patrons to pore over artifacts pinned to the wall behind thick glass, while patrons and tattoo artists continue to use the space as a working tattoo parlor. The centerpiece of the whole collection is a precursor to the modern tattoo machine — an Edison Pen from the late 1800s. "Thomas Edison invented the engraving pen — it punched holes in paper and that is how they made copies," said Myles. "[Samuel] O’Reilly modified the design to be a tattoo machine. That invention completely changed tattooing." Myles said historians believe O'Reilly used his morphed Edison Pen in about 1890, when he worked in Chatham Square, which was crowded with tattoo parlors and flophouses at the time. A tattoo sketch of O'Reilly's — a snake wrapped around a dagger — will also be displayed. The museum will be free, Myles said, and its hours of operation will be the same as its tattooing hours — from midday to 10 p.m., seven days a week. Daredevil's owners have been collecting tattoo memorabilia since the mid-1990s, they said. They found antique sideshow banners advertising heavily tattooed men and women as oddities, travel cases for equipment from the 1920s and tattoo designs sketched onto paper — also known as flash — that were traditionally pinned to walls for customers to choose from. "Tattooing is very much a global community, and we are really hoping to provide a destination for tattoo people around the world," Myles said.